Join us chasing the largest and meanest Steelhead in the world, in the company with our long-term BC partner – award-winning Skeena outfitter Nicholas Dean Outdoor. Imagine yourself airing out a long cast with your Spey rod on one of the Kalum River’s best runs for trophy steelhead, or skating a dry fly across the tailout of a boulder-studded pool on the Copper River for its aggressive steelhead. Or, try tackling the giant Chinook of the Skeena River, fish of over 60 lbs that can melt a reel with line spooling runs, or sight fishing for acrobatic Coho as they take your fly in a large swirl. All in the shadow of towering, snow capped mountains and untouched coastal rainforests, where bald eagles, grizzly bears and other wildlife still roam free. Savor the gourmet, home cooked meals or share your day’s stories over a glass of scotch with a few friends as you relax in the comfort of the lodge. Looking for the quintessential British Columbia angling experience? If so, this is your great chance. You will fish a number of wild rivers, with a opportunity to fish the remote and intimate upper Copper, a true steelhead Mecca. We’ll swing wet flies and, with favorable conditions, fish dries. Fall-run Skeena steelhead is free-rising and will readily pounce on a waking fly — undoubtedly one of the greatest thrills in fly fishing. This adventure also features the exciting opportunity to fish select lower Skeena streams. And – depending on flows, the scenic Kasiks, Exchamsiks and Exstew. Steelhead fishing on the Lower Skeena is unparalleled. Renowned rivers such as the Babine, Kispiox, Sustut, Bulkley, Morice, Copper and Kalum enter the Skeena above our camp and all fish bound for these rivers must pass directly in front of us before reaching their spawning grounds. 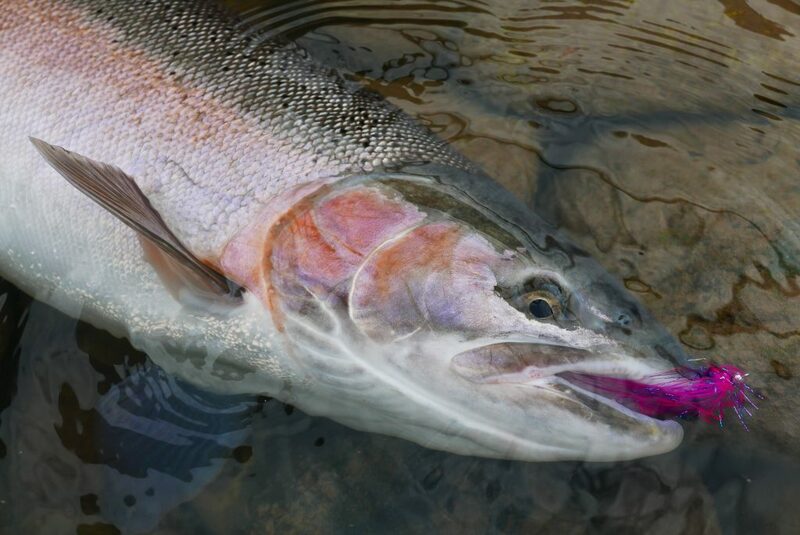 Only a day or two out of the ocean, at the peak of their size, strength and beauty, these are among the biggest and most aggressive Steelhead on Earth. To hook one of these fish on the fly is to touch the heart of the true wilderness — an experience not to be forgotten! Skeena in September is the most exclusive timeslot. We are usually booked over 1 year in advance with indefinite standing reservations – Grab this chance and jump on the “Skeena Wagon” and get a kick you never will forget.